It won’t surprise anyone to learn that we at Hormel Foods plan all year for PB&J Day. 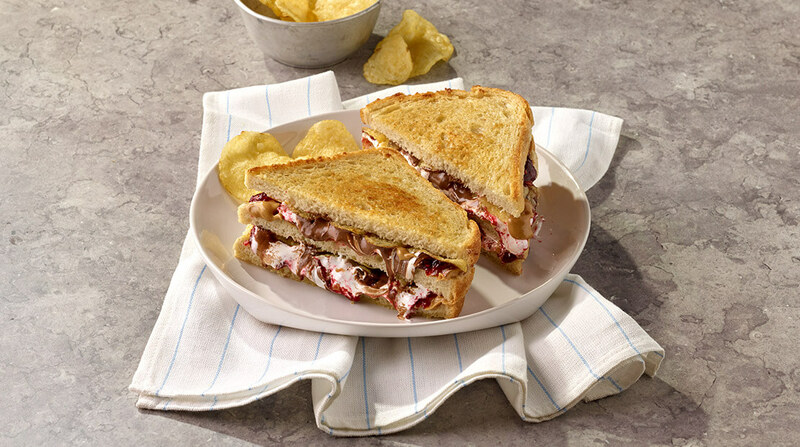 The annual celebration of the sweetest, nuttiest, yummiest creation in sandwich history falls on April 2 — and we take the opportunity to encourage everyone to revisit your favorite sandwich from childhood. We see love letters and social media shoutouts to PB&J from fans of SKIPPY® peanut butter and Justin’s® nut butters every day of the year. We’re proud to be a cupboard staple in most homes, offering natural, preservative-free, protein-packed nut butter as a spread or a grab-and-go snack. Of course, peanut butter from the jar is uniquely satisfying whether you’re 8 or 80. And cooks know that it’s a great enhancement in certain sauces and baking recipes. 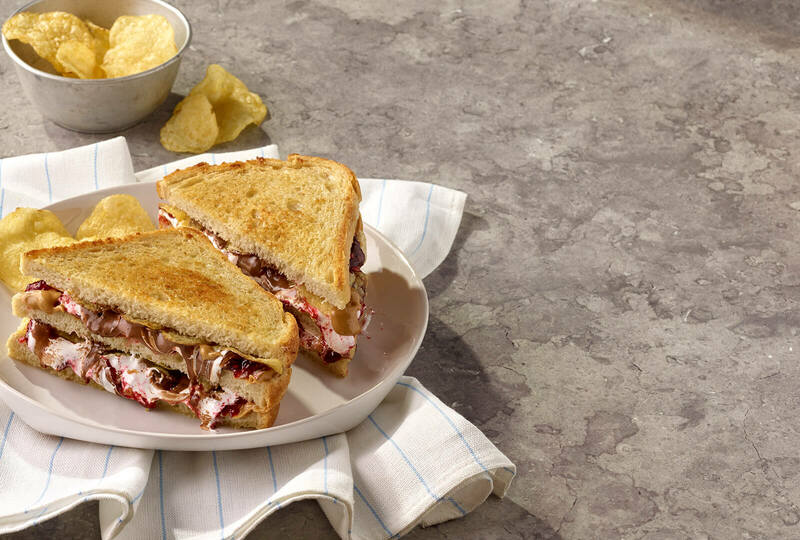 But the classic PB&J sandwich deserves a day of its very own. To celebrate that day, we’ve asked experts from the culinary and nutrition fields to create their own version of a PB&J sandwich. Each has their own longstanding love of peanut butter, which they’ve expressed in their own version of a PB&J. We hope you enjoy them – on PB&J Day and the other 364 days of the year. As a member of the core group of chefs working to develop new products at Hormel Foods, Chef Chris is able to oversee food products not just at the recipe ideation phase, but all the way “from day one through production.” He says there’s no one pathway to creating a new product — even two perfect peanut butters like SKIPPY® SUPER CHUNK® peanut butter and SKIPPY® natural peanut butter spread with honey are entirely different products, each with their own story and flavor. Nothing beats the combination of creamy SKIPPY® peanut butter and rich milk chocolate. Unless it’s married with raspberry preserves, marshmallow fluff, and kettle chips. Better yet, let’s butter and grill it so it’s all warm and melty inside with kettle chips for crunch! Heat griddle or large skillet over medium heat. 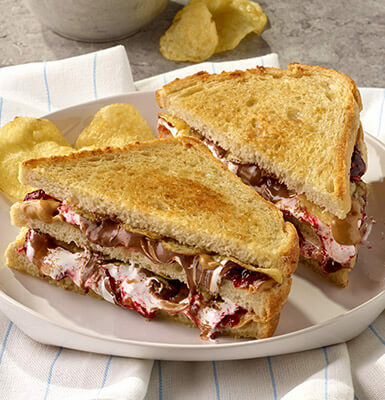 Top each of 2 bread slices with 1 tablespoon peanut butter, 1 tablespoon milk chocolate spread, 1 tablespoon raspberry preserves, 1 tablespoon marshmallow fluff and a layer of chips. Stack the two topped bread slices. Cover with remaining bread slice. Butter top and bottom of sandwich. On griddle, cook sandwich until golden brown on both sides and filling is melted. Cut sandwich into 2 triangles. 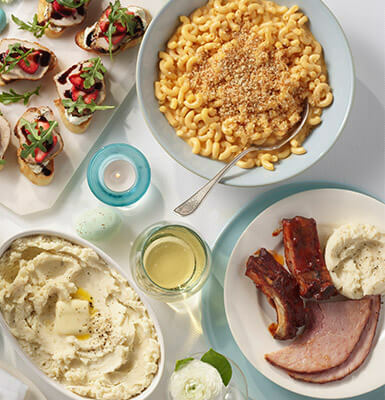 A longtime collaborator of Hormel Foods, Chef Kenneth hails from New Orleans, home of over-the-top rich recipes. 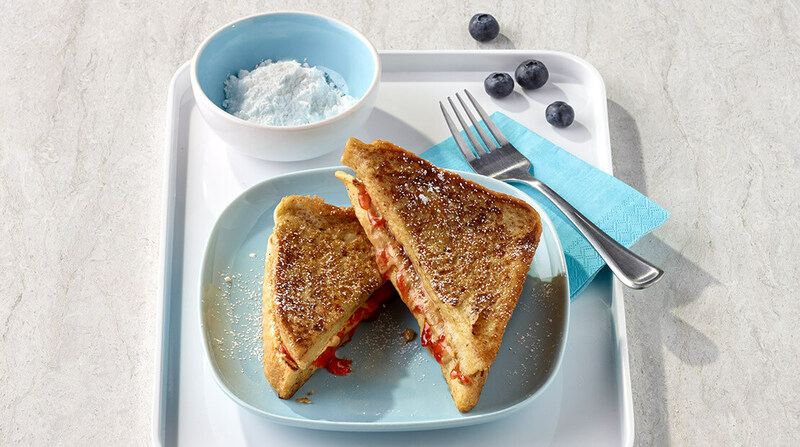 His PB&J French Toast recipe is a decadent yet all-ages treat that’s perfect to serve as a special-occasion brunch for the whole family. Spread peanut butter on one side of each bread slice. Spread jam over peanut butter on 4 bread slices; cover with remaining 4 bread slices, peanut butter side down. Refrigerate 5 minutes. In bowl, whisk together milk, sugar, eggs, vanilla, cinnamon, nutmeg and salt; transfer mixture to a shallow dish. Prepare griddle for medium heat. Brush griddle with 2 tablespoons butter. Soak sandwiches in milk mixture 20 to 30 seconds. Cook sandwiches 2 to 3 minutes on each side or until golden brown. Serve with remaining butter and sprinkle with powdered sugar, if desired. Note: It’s important that you do not use fresh bread, you want it to be slightly dried out so the bread will absorb the custard at its maximum level. However, if you do have fresh bread just slightly toast it before making sandwiches. 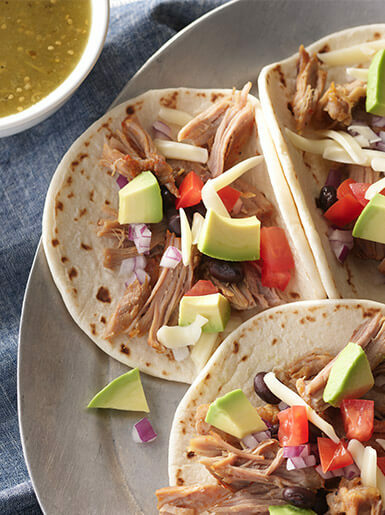 Try stuffing it with sliced bananas and chopped, cooked Hormel® Black Label® bacon. Wellness expert and journalist Tatiana is one of the many fitness and nutrition professionals who rely on Justin’s® nut butters for snacking, desserts and breakfast. For breakfast or a mid-day snack, she leaves out the bread and makes a parfait with greek yogurt and some homemade granola for a good mix of macronutrients. Heat oven to 350°F. Lightly grease a large rimmed baking pan. In medium bowl, place oats, nuts, grapeseed oil, maple syrup and cinnamon; stir to combine. Transfer to prepared pan. Bake 20 minutes or until golden brown and toasted, stirring once at 10 minutes. Allow to cool. In blender container, place fruit and jam. Blend until smooth. Place peanut butter in microwave-safe container. Heat peanut butter in microwave oven 30 seconds or until slightly runny. Set aside. In large glass, place ½ cup of yogurt. Layer with half the melted peanut butter mixture and half the fruit mixture. Sprinkle with 2 tablespoons granola. 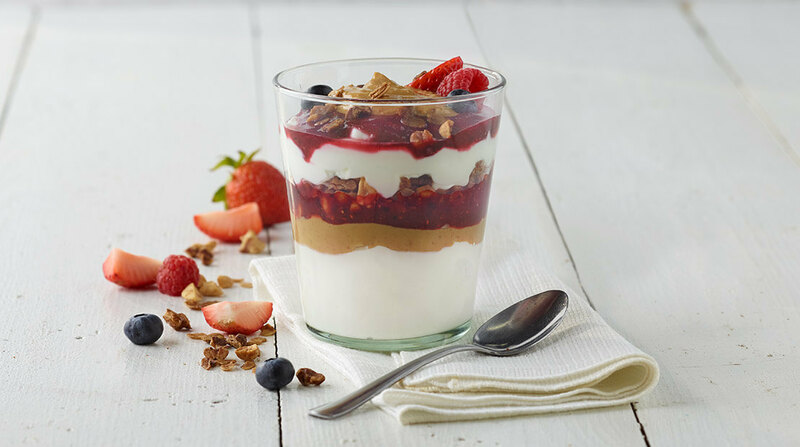 Layer with remaining yogurt, fruit mixture, granola and peanut butter. Garnish with additional berries, as desired.